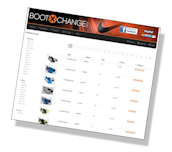 BootXchange.com is a privately run service for parents who are fed up with paying expensive prices for football boots and trainers and for people who would prefer to recycle footwear rather than throw them away. There are also people who like to have worn in boots and trainers to stop those brand new blisters! BootXchange.com is run by a husband and wife team in St Neots, Cambridgeshire. Is BootXchange.com a charity or company? BootXchange is a privately run not for profit organisation,any income that is generated goes mainly on postage and running the website. Any surplus money goes into advertising or stock. We really do need donations to keep us running. 4. Once we receive your pair, we'll send you your reserved pair.